Cleaning a chimney is one job that should always be left to professionals, no matter how much of a DIY-er you think you are. An experienced chimney sweep will safely clear ash and creosote – a dangerous and highly flammable chemical known to cause chimney fires, to ensure your fire burns safely. Additionally, they will perform a visual inspection to ensure your fireplace and chimney are both in good, safe shape. After the inspection, it’s always recommended that you record when your next cleaning should occur so it doesn’t slip your mind. Cleaning a chimney is one job that should always be left to professionals, no matter how much of a DIY-er you think you are. An experienced chimney sweep will safely clear ash and creosote – a dangerous and highly flammable chemical known to cause chimney fires, to ensure your fire burns safely. Additionally, they will perform a visual inspection to ensure your fireplace and chimney are both in good, safe shape. After the inspection, it’s always recommended that you record when your next cleaning should occur so it doesn’t slip your mind. Everyone knows they should regularly check their fire alarms and carbon monoxide detectors. But it becomes an increasingly important routine if your home has a wood burning fireplace. Homes should all have functioning smoke detectors on each level and outside of the sleeping areas. At least one carbon monoxide detector should also be functioning somewhere in your home, typically in high traffic areas. Fireplaces are often designed to be the focal point of our home decor. That being said, decorating too closely around the fireplace can be a dangerous mistake. 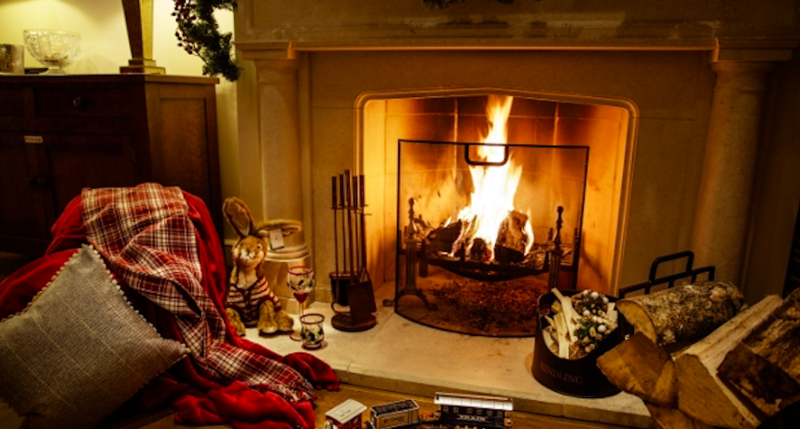 Be sure to keep the area around your fireplace free of anything that could be considered flammable material – furniture, blankets, pillows, pet beds, Christmas trees, decorative rugs, etc. Technically speaking, there should be at least one metre of space between your fireplace and anything that could catch fire. It’s all too easy to light the fire, enjoy it for a few minutes, and then find yourself distracted with something else. But it’s important to maintain your fire from start to finish, without leaving it unattended in between. Once you’re ready to call it a night, spread out any remaining embers to cool, perhaps even covering them with sand to smother them faster. Leave the damper open until everything has cooled, and remove the ashes the next day. If you’re thinking it may be time for your home insurance policy to be reviewed, don’t hesitate to give us a call at Haas Insurance. We’re more than ready to discuss what changes may be beneficial for you and your ever-evolving life.